Outdoor Wedding Venues Dallas | Paradise Cove | Grapevine Southlake Dallas Fort Worth Weddings, Events, Parties, Galas, Banquets and more. Our outdoor wedding venues in Dallas offer multiple scenic locations for your ceremony. 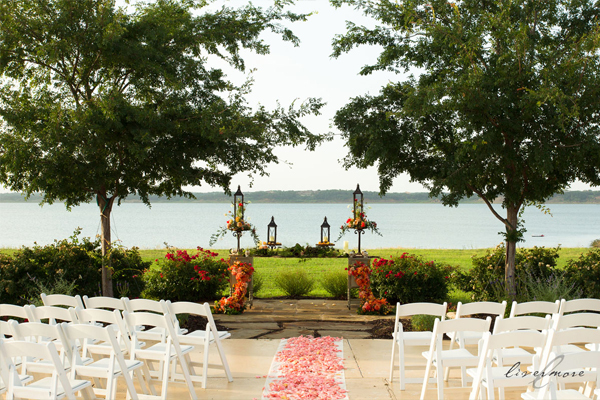 Our landscaped grounds overlook the sparkling waters of Lake Grapevine, and we feature a stone, white gazebo for a formal and elegant setting for a lakeside ceremony beside the lake’s waters. Our elegant gardens and stone paths offer an alternative setting among fragrant flowers, and a Texas blue sky above. Perhaps you would prefer a colorful sunset as the backdrop for your ceremony, a candlelit dinner, and a fire in the fireplace for chilly autumn evenings. We can provide that as well, with the theme you want, the ambiance you desire in our stately lakeside facility. The old oak tree offers a protective arbor for couples to make their vows, providing a shady respite with the lake in the background, its branches stretching for the sky. For those couples who prefer an indoor setting, we offer a spacious indoor setting with lake views for vows spoken before the large stone fireplace under shelter from the elements. Our outdoor wedding venues in Dallas provide nature at its best, situated on the shores of Lake Grapevine for an elegant lakeside wedding. For guests staying in the area, Paradise Cove’s outdoor wedding venues in Dallas is only a short drive, and the area includes recreational activities for such as golf, boating, camping, fishing, marinas, parks, trails, and much more to keep them entertained while in the area. Furthermore, we only host one wedding/activity per day to ensure that our attention and services are entirely devoted to you and your guests alone. This provides the additional benefit of moving your party indoors when the weather threatens to ruin your wedding. At Paradise Cove, we commit all of our resources to our clients, one couple at a time. Paradise Cove offers a luxury wedding venue, and the complete convenience of our capable staff handling the details, so you can concentrate on being beautiful, and leave the rest to us. In addition to the wedding ceremony, we also provide spectacular indoor or outdoor receptions, and your own wedding coordinator to ensure a flawless process from beginning to end when you depart for your honeymoon. Dining options at Paradise Cove range from a luxurious dinner provided by our caterer or yours, on the tranquil garden patio, or indoors with a stone fireplace and views of the lake for up to 200 guests. To learn about all of our dining options, and features, contact us for an appointment to tour our facility. Our capable staff will provide the personalized, luxury wedding you dream of in our picturesque outdoor wedding venues in Dallas. We specialize in outdoor waterfront weddings, and the professional staff of Paradise Cove can take care of all the details for you, allowing you to enjoy your special day. Give us a call for additional information, we will explain our services, our options, and all the information you need regarding Paradise Cove’s outdoor wedding venues in Dallas.